Return to the 1990s to examine a crucial era in our latest History of Captain Marvel! Next week, CAPTAIN MARVEL #2 continues the brand-new tale of Carol Danvers' latest foray into...an apocalyptic wasteland?! Read the first issue right away, then report to your local comic shop on February 13 as Captain Marvel history unfolds. But for now, let's dig into Carol's past as we continue to examine the history of Captain Marvel. Few events have rocked the Marvel Universe more than Onslaught's attack back in 1996. Members of the Avengers and the Fantastic Four flew off against the villain to end his threat and appeared to perish. In reality, the incredibly powerful Franklin Richards shunted them off to a side universe that they eventually returned from. 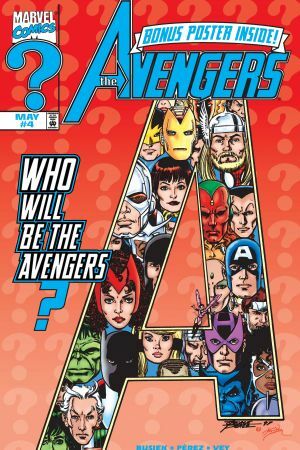 When Kurt Busiek and George Perez relaunched AVENGERS in 1998, they brought back just about every available member to take on the threat of Morgan Le Fey. 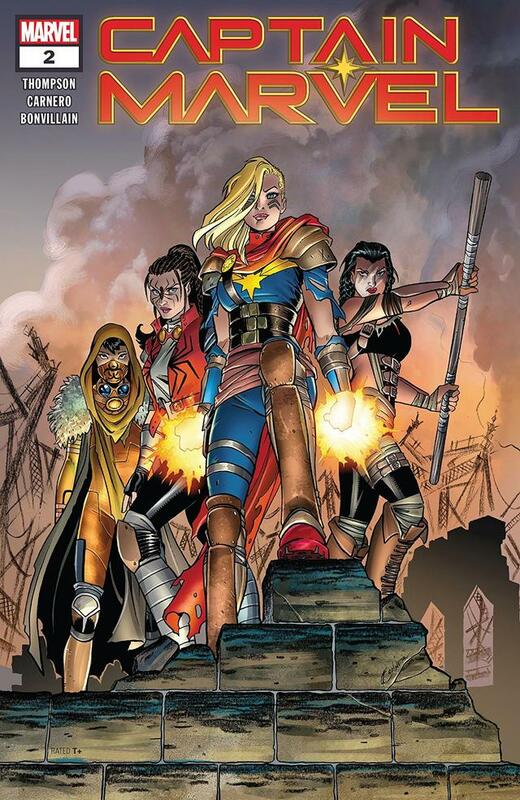 Carol Danvers offered her services, showing off Binary powers in her black Ms. Marvel costume. After taking the magical menace out, the Avengers found themselves faced with way too many members; too many heroes rushing in to take on a simple threat led to a great deal of trouble, like Carol accidentally blasting off Machine Man's arm! While the founders tried to narrow down the new line-up, Danvers met with Beast to get a read on her power levels. In AVENGERS #4, after he informed her that she probably couldn't shift into Binary form anymore, she asked him not to say anything to the others because she really wanted to be a part of the team. Iron Man brought up his reservations about bringing Carol into the team, but withdrew them, not wanting to get into the details about issues with her personal life. As a result, she made the team! By AVENGERS #5, Carol had officially switched over to the codename Warbird as a way to pay homage to the planes she loved as a kid. Though she acted cagey around Captain America about her power levels, it became a problem when Hyperion of Squadron Supreme knocked her out as Cap called for her to go Binary. After the battle, Scarlet Witch questioned whether she could personally handle the new responsibilities. Not long after, Danvers flew off in a rage after Captain America wanted to know about her power status. Things went from bad to worse for Carol during the LIVE KREE OR DIE crossover which ran through IRON MAN #7, CAPTAIN AMERICA #8, QUICKSILVER #10, and AVENGERS #7. Her inability to convey her power levels and get control of her personal holdups led to so many problems during the alien invasion that she stood before an official inquest in issue #7. Though it seemed like they were ready to kick her off the team, she quit before they could. From there, Carol popped up in books like IRON MAN #11-12, wherein she tried to start a new life in Seattle only to run right into Iron Man again. She also had some hang time with Logan in WOLVERINE #133-134 which was great, but was still plagued by her personal problems. She may have helped her old teammates take down the Doomsday Man in AVENGERS #17, but Carol still hadn't gotten control of her issues when she ran into the Armored Avenger again in IRON MAN #18. He could tell she was having a tough time, which meant her foes Golden-Blade and Snapper weren't as out of commission as she thought. After realizing how badly the fight could have gone, she asked Stark for help. Danvers only fully embraced getting help, though, after accidentally downing a plane while going after Shell Head in IRON MAN #24. She even turned herself in to a federal tribunal, revealed her identity, and came clean about her problems. At that same time, she had been tricked into going on a mission by Taskmaster posing as Captain America. Even with those knocks against her, Iron Man put her up for membership again in AVENGERS #27, which would not only give her a way to redeem herself as a hero and give her a support system, but also work off the sentence from the plane incident. And with that, she officially rejoined the team to help fight the likes of Kulan Gath, Grim Reaper, Madame Masque, Count Nefaria, and a whole city of Hulks! Along the way, she also went on a date with Vision who was trying to experience more of human existence. 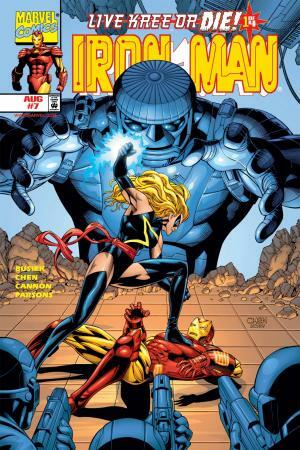 Carol's past came back to face her when THE KANG WAR ran through AVENGERS #41-55. 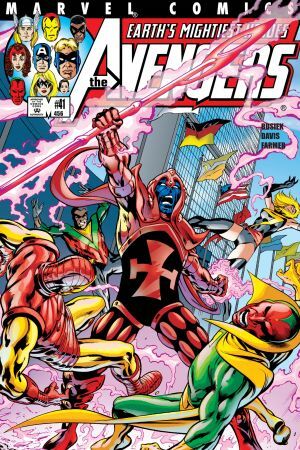 The Conqueror not only positioned himself as the potential savior of the present, but also utilized his son the Scarlet Centurion. Upon their first meeting, the new player sounded familiar to Danvers and she realized he was Marcus from Limbo (who we covered in Part 2 of our Histories of Carol)! However, he revealed that he was actually a different Marcus, the son of Kang before he became Immortus. He claimed to be smitten with her, but also said he had no intention of manipulating her, even offering help if it wouldn't directly betray Kang. Soon after, Warbird infiltrated the base of the Master of the World with some help from Marcus. After asking for tech that could help stop Kang's invasion and being denied, Danvers did what she had to do and stabbed him to death in AVENGERS #48. She remained up front about the whole endeavor and, after they defeated Kang, stood before her fellow Avengers on trial once again. This time, though, she was completely vindicated, as Captain America explained that the killing had been justifiable in war time. That level of approval from her teammates helped boost Warbird's confidence as a hero and a member of the team! Warbird would go on to serve on and off with the Avengers for the rest of the run, facing off against Scorpio and the Red Skull. Warbird even completely changed her costume in issue #65 to something much more tactical. Proving herself an invaluable asset in keeping the country safe during the Red Skull mission in AVENGERS #65-70, Carol received an offer she couldn't refuse when the President asked her to fill a new position: Chief Field Leader of Homeland Security. 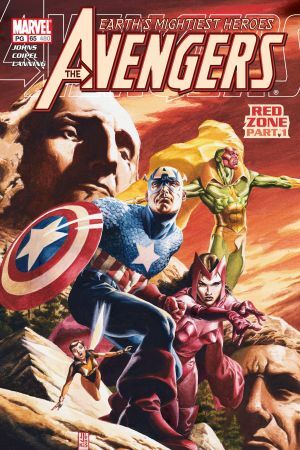 When the team began falling apart because of Scarlet Witch's diminishing hold on reality during the DISASSEMBLED story in AVENGERS #500-503, Danvers showed up. She didn't believe Wanda could have done all this, but once convinced, she railed against her friend for killing Hawkeye, Vision and Scott Lang. Carol hated Wanda for a while, even after they took her out, as she said in AVENGERS FINAL, but grew to forgive her. In the wake of the attack, the Avengers reformed in NEW AVENGERS, but Warbird was not a part of the new squad, though she would return in more ways than one just a little bit down the road! Read CAPTAIN MARVEL #2 at your local comic shop next Wednesday! Get ready for "Marvel Studios' Captain Marvel" on March 8! And stay tuned to Marvel.com for Part 5 of the History of Captain Marvel!